Hi friends! After a busy week in Nashville, I'm back in NYC and I couldn't be happier. Today is one of those dreamy spring days where the sky is bright blue, the sun is shining, and all the cherry blossom trees are in full bloom. We're talking cotton-candy colored trees everywhere. Tulips and daffodils are at their peak, and winter-hardened New Yorkers are walking around with actual smiles on their faces (can you believe it?!). Everyone's sitting outside, soaking up the sunshine – you'd kind of think the whole city took the day off work! I could go on and on, but what I really want to talk to you about is naan. You know, those warm, puffy, oval-shaped flatbreads they serve at Indian restaurants (ideally brushed with ghee). The ones that you can't stop eating? I'm obsessed. Though I always keep a pack of store-bought naan bread in the freezer so I can whip up naan bread pizzas (Tomato & Basil, or Ricotta with Shaved Asparagus), I've recently started making my naan from scratch and oh. my. goodness. The homemade ones will truly knock your socks off. They've got that same tangy flavor and puffy, heat-blistered texture that I love. It's the perfect accompaniment to a slow-cooked dal or chicken tikka masala – or my Tomato Chickpea Curry with Kale. 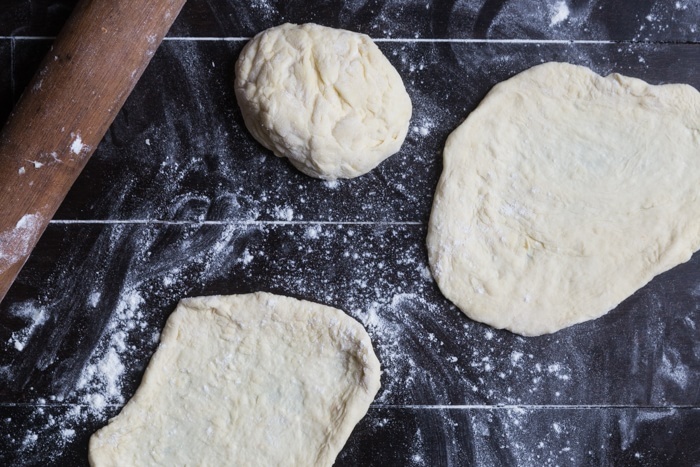 And though it does take some time for the dough to rise, naan is really not that hard to make. 1) When you're adding in the warm water, use a thermometer to make sure it's exactly 100 degrees. If it's too hot, it will kill the yeast and it won't bubble. 2) Though I had high hopes for whole wheat naan, the texture is best when it's made with all-purpose flour. The wheat flour absorbed much more liquid, and though the dough was really easy to work with, the naan turned out a bit dry and lacked flavor. The all-purpose flour dough was really sticky, so you have to add in flour as you're kneading, but it puffed up beautifully when cooking, had a much more tender texture, and the flavor was great. 3) A pizza oven works amazingly well for naan. These naan turned out the puffiest of all, and got a great char on the outside (which I love). Of course, since most of us don't have pizza ovens, I found that a cast-iron skillet or a non-stick skillet or griddle over high heat work well. 4) Use active dry yeast out of a jar or a package – but not the rapid-rise kind. 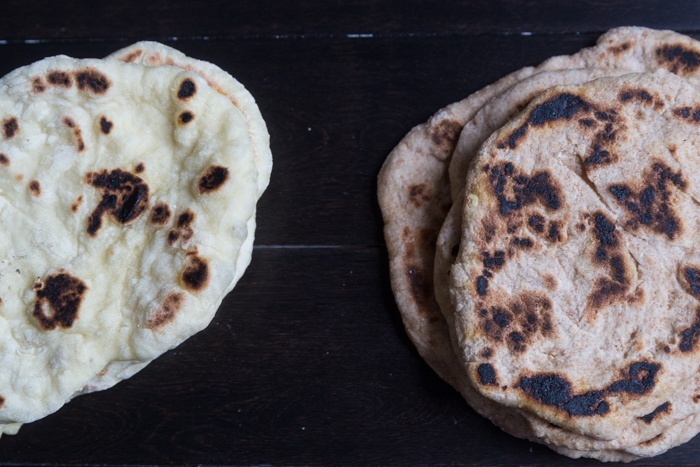 The rapid rise works more quickly, but you'll lose texture and flavor in the naan. 5) The only equipment you need is a rolling pin. And a cast iron skillet or large nonstick pan. 6) The longer the naan dough rises (up to 4 hours), the better the flavor. But honestly I think that the best result was to let the dough rise for 2 hours, then knead and make the dough balls, and let them rise 30 minutes. Then roll and cook. 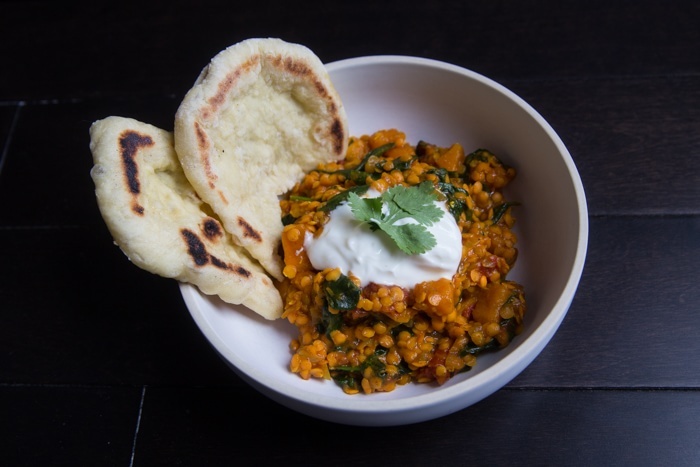 Enjoy the recipe, and stay tuned Friday for a yummy, vegan dal recipe (orange lentils, sweet potato, and spinach) to go along with your naan!